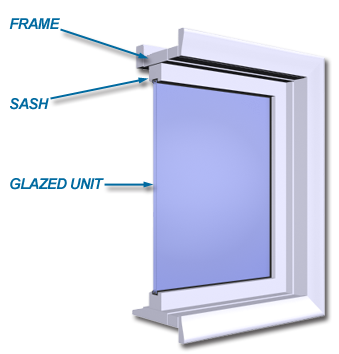 All windows consist of glazing and framing components. The glazing fits into the sash and the frame holds the sash. The frame is the outer most structural part of the window which gets fastened to the opening in the wall of the building. While it is easy to look at a window and just see the glass, it is important to realize that the sash and frame can occupy as much as one-third of the total window area and, therefore, can be a major source of heat loss if not properly constructed. The types of heat loss associated with the sash and frame are conduction through the material, and heat loss from air leakage. Frames and sash are manufactured using a variety of materials. Each material has it strengths and weaknesses and it is important to remember that good quality windows can be made from any of these materials as long as they are designed properly. Aluminum frames and sash are strong, lightweight and durable. In addition to its strength, aluminum is low maintenance and resists warping. Aluminum however is a high conductor of heat energy and, as such, a significant source of heat loss. To compensate, aluminum frames and sash must incorporate an effective thermal break, such as PVC or urethane, between the inside and outside surfaces to counteract conductive heat loss. Wood frames and sash are desirable for their natural beauty, good insulating value and structural strength. They do however require significant protection from the elements as well as regular maintenance. Manufacturers are required to treat wood with a preservative to help prevent rotting. Wood frames and sash are often clad on the exterior side with PVC, aluminum or other factory-applied finishes to reduce the maintenance requirements and increase its durability. Extruded vinyl or PVC is relatively new and has grown in popularity because it is a good thermal performer, lightweight, resistant to the elements and is easy to maintain. Larger windows may not have sufficient structural integrity and must therefore be reinforced to increase their strength. Fibreglass is the newest material to be used in window frames and sash. It is very strong and durable and requires little maintenance. Sometimes, the hollow core in the frames is filled with foam for even greater thermal performance. Combination frames and sash combine two or more of the materials described above. The objective is to capitalize on the best features of each material so that the finished product will provide good thermal performance, durability and strength, and require minimal maintenance. Composite materials, in contrast to combination frames, blend different materials, such as wood fibres and resins for example, together into a single unified composite material through a manufacturing process. The frames and sash are then manufactured from this unique new material.